China 'The Last Frontiers'? No! Just unfold a map of China, hold your right hand over this cluster of provinces organised around the Yellow River and the Yangzi River and stretching from the Yellow Sea in the north to the South China Sea! Here, in this relatively small part of China live the multimillion Han-Chinese, developing their country faster than almost any other country in the world, drinking Champagne on the 87th floor of the Jin Mao building in Shanghai, cutting elevated roads through the middle of down-town Shanghai with a speed, that even makes the 21st Century astound! 'Last Frontiers'? No! China 'The Last Frontiers'? Yes! Stay for a while in Shanghai. Go to that places, 'good' tourist guides wouldn't take you to: The small lanes of Old Shanghai, where buckets of night soil are carried to the next disposal place; where the older people are sitting outside their wooden houses on summer evenings because sleeping is impossible under the hot wooden roof; where the same people enjoy the warmth of a winter sun on their tiny bamboo stools, because its too cold inside the house which does not provide any heating! Come to the big and developed cities ? and find those Last Frontiers! Try to visit one of the traditional homes of the Beijing people, the 'Hutongs' that are being pulled down faster than you can image! 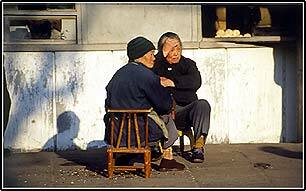 - The same fate is happening to the 'Longtangs' in Shanghai. For the sake of modern comfort people are moved to the outskirts of the cities into anonymous housing silos, where social structures and sound neighbourhoods will have a hard time to build up again. Come to the loam plateau of Central China, Shaanxi, NingXia and Gansu Province! Return to your map and check what your hand didn't cover: the huge part of western and north-western China: Xinjiang-, Qinhai-, Sichuan-, Gansu- and Yunnan province. Find out what may be considered 'The Last Frontiers' of China. Go west! Like in Australia, this saying means going to the 'wild': remote, sparsely populated, barren country! The loam plateau obviously did not only conserve the Terracotta warriors, it also conserved life style and housing habits! High altitude 'Grassland', where the sources of Yellow river lie! 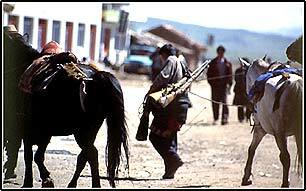 Herdsmen watching their yaks from the back of their horses, carrying rifles to protect their cattle. - Their homes, black yurts set up on the grass during summer; dark, small loam structures, that are shared by the animals during winter. 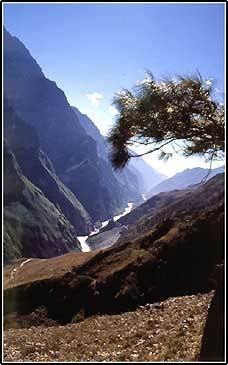 Go to the south-west where Yanzi is still so narrow, that even a Tiger can jump over it! 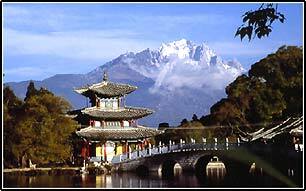 - Yunnan province, where you can meet some of those 24 ethnic groups, some of them only counting a few hundred! Head out for all those provinces bordering Mongolia, Kazakhstan, Kyrgystan and Tajikistan! Here is where you can explore the different routings of the old Silk Road. The Sunday market of Kashgar! The Taklamakan Desert! The Turpan grape valley! This IS 'Last Frontiers' at its best!